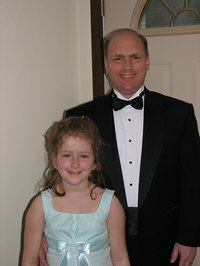 Daddy-daughter dances are sweet reminders that little girls grow up fast. Daddy-daughter dances are priceless occasions for fathers and their little girls. Even dances that start out awkwardly can end with both dads and their daughters beaming from ear to ear. Send them home still smiling with a keepsake for each or for the pair. Have a couple of designated photographers ready and waiting with cameras and portable photo printing machines to photograph each daddy-daughter couple at the beginning of the dance. Print the photos and cut them to fit small decorative frames. Present one to each pair as they leave the dance. Create candy-filled hearts that can be given to each dad and daughter using clear plastic two-piece heart ornaments bought from a craft supply retailer and embellished with your own touches. Use pink or red felt tip markers and print the words "My Heart Belongs to Daddy" and "My Heart Belongs to My Little Girl" on plain, round stickers. Place a sticker on the inside of one half of the plastic hearts. Fill the hearts with pink or red candies, and close each heart with its second half. There will be a small hole at the top of each heart through which you can thread a piece of thin ribbon for hanging the ornament. Use chocolate lollipop molds in the shape of half a heart to create a sentimental favor for dads and daughters. Buy chocolate melts and white lollipop sticks. You'll also need vegetable oil, wax paper and one 12-ounce bag of chocolate chips for every two bags of chocolate melts. Microwave the chocolate melts and chips on low temperature for three minutes, then on high for four minutes. Stir until smooth. Add the chocolate to the molds a teaspoon at a time until just below the top of each mold. Insert a lollipop stick into each heart half and place in the freezer. After about 15 minutes, try popping out a lollipop to test for firmness. Repeat the process until you've made as many half-heart lollipops as you need. Store in the refrigerator until the dance. Put each lollipop in a small plastic or cellophane bag and tie with a colorful ribbon. Dads and daughters each receive half a heart on their way out the door as a symbol of how the pair makes a whole heart.